10:00 AM - 3:00 PM, Monday/Wednesday/Friday, and 12:00 PM - 5:00 PM Tuesday/Thursday/Saturday. After January 15, the distribution center will be closed and we will be unable to accept any further items as gifts in kind. 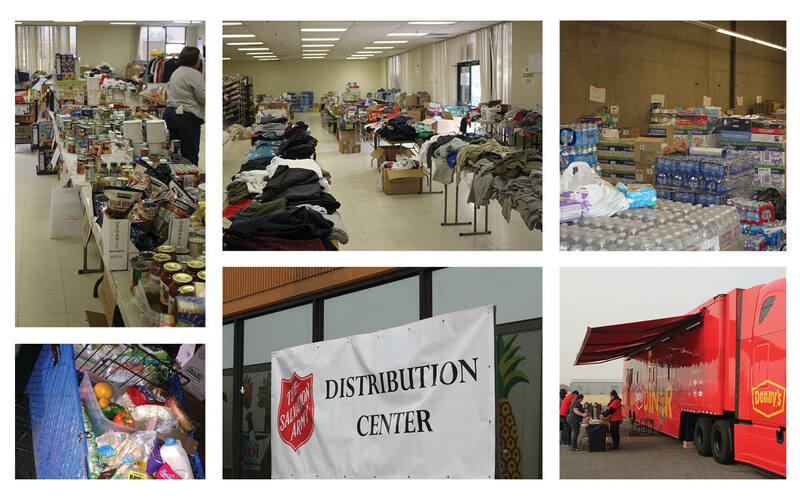 At 1100 Marauder Road in Chico, The Salvation Army has turned a large, empty warehouse into a thriving distribution center for the Camp Fire. Its purpose is to sort items donated to the Army, and give them to Camp Fire survivors. Many companies and individuals have donated essential items and gift cards for the cause. The center has already provided items for 20,000 Camp Fire survivors. The operation is an organized one. On one side of the warehouse, a stream of donations is constantly coming in and being sorted. On the other side, Camp Fire survivors are coming in to pick up non-perishable food items, fresh food such as milk, eggs, cheese, and meat, as well as blankets, pillows, diapers, formula, new clothes and more. People are coming all day, every day. At times, during the early days of the fire, there was a line as long as 30. While mostly families, we're seeing people of all ages. Once checked in, each person or family is given a shopping cart and goes around the warehouse with a volunteer, filling up their carts with whatever specific items they need. When available, they are also able to receive gift cards to local retailers. Many volunteer groups are coming throughout the day. Raley’s has provided two freezer trucks to store the fresh food, and they've also donated food. Denny's has come to provide on-site breakfast. The overall mood at the distribution center seems to be calm and full of gratitude. Even after the horrible experience of the fire, the distress and shock seems to subside while survivors are there. Staff and volunteers, too, are in good spirits, as they work to keep things running smoothly. Salvation Army Officers are even able to provide emotional and spiritual support to those who are open to it. See video below.